Typically the mistake is made to only focus on 1 or maybe 2 of these areas. Each area is very important and valuable on its own; however we know that businesses can increase their overall growth and profit on a more consistent basis by focusing on each of these key areas. In order to help you understand each of these areas; Reputation, Reach, Resell and Referral these are all explained in detail below. Reputation: Having a good reputation online can either make or break your business. Recent studies show that more and more consumers are looking at a business’s online reputation BEFORE making a decision to do business with them. The first phase of our Marketing System focuses on your Online Reputation. If your business doesn’t have an Online Reputation or has a poor one then this will greatly impact your business. Improving your Online Reputation will allow your business to be in a position to attract more customers and if you have a better reputation than your competitors you will typically get the business over them. We address your Online Reputation by setting up a system to make it easy for your customers to leave you a review online. This is a complete end to end system that will help you get the reviews, address any negative ones and ensure the positive ones are published online where it matters. Reach: A Business that wants to grow needs to make sure that more people know about it today than did yesterday. In order to grow and expand your business it is critical that potential customers know about your business and what you offer. This is the second phase of our Marketing System. (If you haven’t already read about Phase 1 – Reputation please do so now). Resell: You’ve spent the time & money to get a new client. Maximize the value of your customer base. Now that you have worked hard to create a strong Reputation, and Reach new customers the next phase of our Marketing System is the Resell phase. You worked hard to find your customers, so now you need to be looking for ways to continue to offer them more value and opportunities to purchase from you. In the Resell Phase one thing to keep in mind is that the money is in the list!! In this phase we work with you to ensure you are touching your customer list on a regular basis so they know what you do and what you offer and you are always top of mind. Referral: Customers that are referred spend more, convert better and shop faster. Having a system in place to get more of them only makes sense. 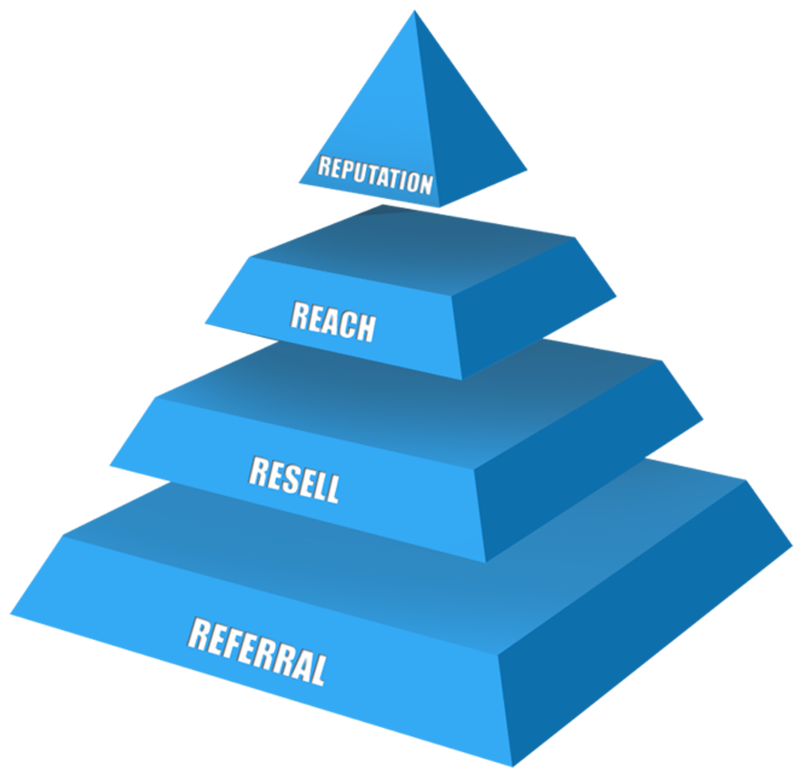 The last phase in our Marketing System is the Referral. You have worked really hard to ensure you have a solid reputation online, are reaching new customers and are reselling to your existing customers on a regular basis, now it is time to get referrals. The previous phases of our Marketing System have helped you build happy customers – now we just need to get those customers to tell their family and friends about you. In the Referral phase of our Marketing System we will work with you to develop a Referral program to make it easy for your existing customers to refer you to those that know.